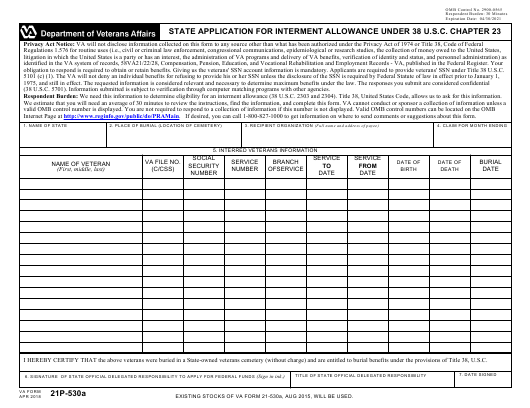 VA Form 21P-530A or the "State Application For Interment Allowance Under 38 U.s.c. Chapter 23" is a form issued by the U.S. Department of Veterans Affairs. Download a PDF version of the VA Form 21P-530A down below or find it on the U.S. Department of Veterans Affairs Forms website. obligation to respond is required to obtain or retain benefits. Giving us the veterans' SSN account information is mandatory. Applicants are required to provide veterans' SSN under Title 38 U.S.C. (38 U.S.C. 5701). Information submitted is subject to verification through computer matching programs with other agencies. Respondent Burden: We need this information to determine eligibility for an interment allowance (38 U.S.C. 2303 and 2304). Title 38, United States Code, allows us to ask for this information. Internet Page at http://www.reginfo.gov/public/do/PRAMain. If desired, you can call 1-800-827-1000 to get information on where to send comments or suggestions about this form. I HEREBY CERTIFY THAT the above veterans were buried in a State-owned veterans cemetery (without charge) and are entitled to burial benefits under the provisions of Title 38, U.S.C. EXISTING STOCKS OF VA FORM 21-530a, AUG 2015, WILL BE USED.